This is Step #1 of a three part process to clean, lock in out-gassing chemical content, and to seal the carpet for dirt resistance! biodegradable. It does not irritate hands or skin. 61210 (quart) and 61110 (gallon). -Odorless, non-offensive to user and occupant. system for reducing the effects of carpet toxicity. 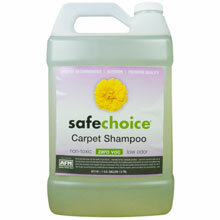 -Safely used by and for the chemically sensitive. -Reduces indoor air pollution from soiled carpets. will clean approximately 300 square feet. shampooing or carpet cleaning machine. CLEAN UP: Clean tools and equipment with clean water. natural fiber absorption, can pull dirt back into the fibers. foil under the furniture legs until carpet is thoroughly dry. chemically sensitive, always test for personal tolerance. guaranteed not to be defective when properly applied. areas before application to the entire surface.